Right on, Mr. Hiwell: The music of the Army being in general very bad is a post I could never write, because I lack the detailed knowledge, or the desire to acquire music-specific knowledge (just as Mr Hiwell could give two rats’ about stay-making details, or the subtleties of stew). But here’s the gist of his post, on which I wish to elaborate, and which has been touched on elsewhere: You’re Doing It Wrong. I’m tired of going to events, knowing all the camp duties fifers and drummers played from sunrise to sunset and never playing a single one of them besides Drummer’s Call and Assembly. One of my favorite hobby horses: lack of discipline and camps that look like that Infamous Catalog just puked on a field. Why on earth can we not see tents are set up properly, in rows, with appropriate numbers of kitchens instead of wobbly lines, marquee tents that disgorge giggling teenage girls in bodices, and enough iron to make the scrap man sing with joy? But even then, even if people are too lazy or stubborn to leave stuff at home, why can’t a camp run the way it would’ve? There’s ample documentation on which to draw. Quite aside from the voluminous papers of General Washington and General Greene, and the massive archives in Britain, every regiment had orderly books, of which many survive. They’re hilarious reading and full of things to do. Most reenactments are boring. Well, so was army life. 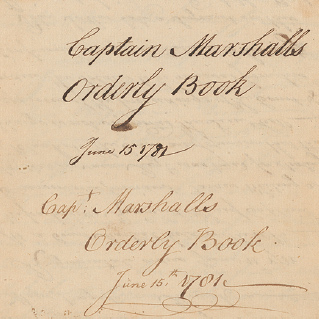 The 10th Massachusetts was constantly in trouble up on the Hudson late in war, and the Marshall book at the Society of the Cincinnati contains the proof. Here’s something fun to do: inspection. Huts, cabins, tents: they all needed to be kept neat., and apparently weren’t. Don’t like to clean, prefer cooking? Marching? the Regiment will turn out to Morrow Morning at the Beating of the Revelee and to March By Six oClock they are to pack there clothing and kook there provisions this Evening when they have arivd on the Ground for Encamping the officer commanding on the Spot will order a partry if Forty men from the Regiment a Capt and two Sub’s to Command them to Return to the Encampment in order to asist in Bringin on the Baggage the Soldiers are to Carry there kittles in there hands and are to Leave there arms and pakes &c at the New Encampment any Soldier who is found Plundering another pack is to be tyd up and punished with out Trial..
Tyd up and punished without Trial. You know there’s a guy who’s up for that in every unit. This is easy, people. Authenticity, accuracy, and Stuff to Do increases exponentially if you use documentation to recreate a “normal” day in either army. There’s Cuthbertson, for example. There’s Lochee, if you want to get in tents. And orderly book after orderly book. And if I, a mere woman, can find these things, there is no excuse for you men not to read, absorb, and use these sources well. Inspections. Returns. Reports. There’s so much to do in a day, and running a camp or a barracks by the regulations would give everyone so much more to interpret, and begin to present real history instead of merely heritage. This is where the real splits are going to come, and sooner than you think. It won’t be about uniform details, or stitch and thread counts, but about actually engaging historical interpretation. If interpreters aren’t engaged, the public won’t be either. *If you know me, you know what the next word is. Keep in mind not every organization has camp life as a focus of its existence. This means institutional it is not an emphasis. What is ore the level and savagery of discipline is not something many are interested in. I note also how little the veterans who play (you know, those who can actually say they understand and can/have lived that kind of discipline) seem to want it. Still I am sure it could be arranged. Mr Siegel, I think you may be talking past my point. Unless you regard the camps that most reenactments include as serving as a strictly backstage area, every place I’ve ever been has incorporated a camp open to the public. And the camps I have seen have often been poorly organized, run according to no discipline whatsoever, and have thus languished, under-interpreted, for the public. Certainly most units and the Big Three seem to have running around with muskets in formalized, ritual expenditures of black powder as their focus, rather than camp life, military discipline, or organization. What I’m arguing for here is not to have every veteran whipped, but for a more rigorous and complete interpretation of the past, rather than the assemblage of re-enactorisms that permeate the hobby. Running a day according to an orderly book account would be a free way to up everyone’s ante in terms of accuracy and engagement– and I think that’s how you get more people involved. It’s certainly working for some units. Thank you, Ma’am! Well said. Whatever is in public view is (or was at one time in the distant past of the hobby) supposed to be part of the educational program and it’s our responsibility to make it so. Really, it’s a failure of leadership in the organizations that has been ongoing since the Bicentennial, so the individual members are less to blame due to having so few good examples to follow; leadership having allowed some to make discussion of improvement of standards a toxic battlefield, for the sake of placating a few malcontents and keeping warm bodies in the ranks. The membership have not been led with any sense of purpose. Sadly, this pandering to the lowest common denominator has led to hundreds nay thousands, over the years, to expend thousands of dollars, immense amounts of time and effort, to defeat the cause they joined with the best intentions. The ultimate victims of course, are the people who made the history. It’s not wrong because a few of us just don’t like it, it’s wrong because those who lived and died through it and recorded their experience aren’t being allowed to have their say. Thank you for taking a stand for them! I just wanted to offer a take on reenactments from the side of a member of public who enjoys heritage tourism. I’ve noticed very few camps that offer any kind of organized interpretation. In my own experience it can be hard to find out which reenactors in the camp want to interact with the public, and which folks just kind of want to hang out and chat amongst each other. It’s interesting what you can overhear them talk about, usually not about the 18th century. At a Battle of Bennington reenactment. I can remember Crown forces joking around about walking out on a train trestle as they marched up towards the battlefield. I think you have a lot of great ideas to make camps at reenactments, more interesting and educational. I was wondering if you envision this being accomplished through third-person interpretation or first person interpretation or some combo of both? What would it take to get reenactors to act like interpreters? and what differences do you see between the missions of reenactors and costumed interpreters? How close can living history folks even get to recreating the past?